InteriorMark, LLC is proud to introduce the cutting edge re-design of TheaterSeatStore.com, the leading online retailer of quality home theater seating. The new format provides customers with improved navigation, one page checkout and a host of other features to make the shopping experience more efficient and enjoyable. Many of these features are the result of customer requests by new and returning shoppers alike. The home page of TheaterSeatStore.com features an intuitive menu that makes it easy to start your search. 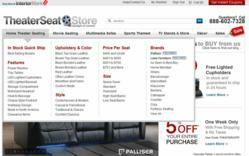 InteriorMark, LLC, the premier online retailer of quality home furnishings, is proud to announce a complete re-design of one of their flagship retail websites, TheaterSeatStore.com. The site has been completely redesigned to better serve the needs of online shoppers. The new site features enhanced menu navigation to help shoppers find furniture according to features, styles, price and other criteria. It also boasts major changes to the product pages to highlight vital information, and has new sales support features like a streamlined chat system that makes it simple to contact a sales or customer service professional. “With this new website design, our customers can search for products by feature, price, finish, style and many other categories. For example, they can bring up seats that have lighted cupholders, or are available in black leather. This makes it easy for them to find the home theater seat that perfectly fits their needs”, said Bruce Tucker, Vice President of Marketing for Theater Seat Store. Tucker went on to say, “If customers have questions, they can contact one of our qualified sales or customer service professionals with a single click”. The search menus have been completely reorganized to be more efficient and easy to use, thanks to several new “Shop By” filters that have been added. For example, customers can click on a link to only look at black leather home theater seats, or they can choose to view by design and look at only modern home theater seating. Customers interested in a specific feature like motorized headrests can easily search by feature. “With so many products on TheaterSeatStore.com, and new ones being added every month, customers asked us to make our menu system easier to navigate. We listened to them and now have a cutting edge site to be truly proud of”, said Mr. Tucker. Product pages have also seen important upgrades to make them easier to read. A new zoom feature allows customers to take a closer look at product photos to aid their decision. Pricing configurators and dimension information have been moved to the top of the page. This prevents frustration from scrolling or clicking on tabs to find the information. Customer reviews have been removed from their separate tab and placed on the main product page. All of these changes have proven through extensive testing to give customers an easy and fun shopping experience that takes the fear out of online shopping. InteriorMark takes Sales support very seriously, and has added enhancements to make it easier to contact a Sales or Customer Service Professional. 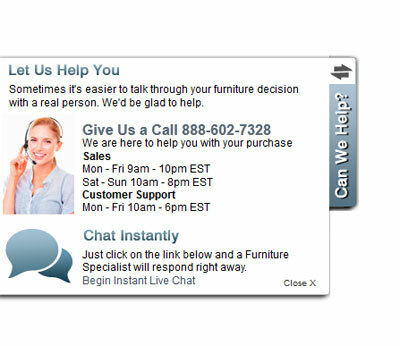 Online chat windows can be opened with the click of a button, and the chat link is prominent on almost every page. Sales and Customer Service questions can also be answered by phone or email, and contact information is easy to find. “Often, customers have a question that cannot be answered by images or descriptions. This is why we have a dedicated sales staff ready to help via phone, email or chat”, added Mr. Tucker. InteriorMark, LLC is one of the leading online retailers of home furnishings. InteriorMark’s family of websites are dedicated to almost every room in the home including living room, dining room, home office, bedroom and home theater furniture. They are fully committed to providing great savings on quality furniture products from leading manufacturers. InteriorMark is a member of the National Home Furnishing Association and an A-rated member of the Better Business Bureau. Categories can be refined with filters like price, style, or features like the lighted cupholders shown here. 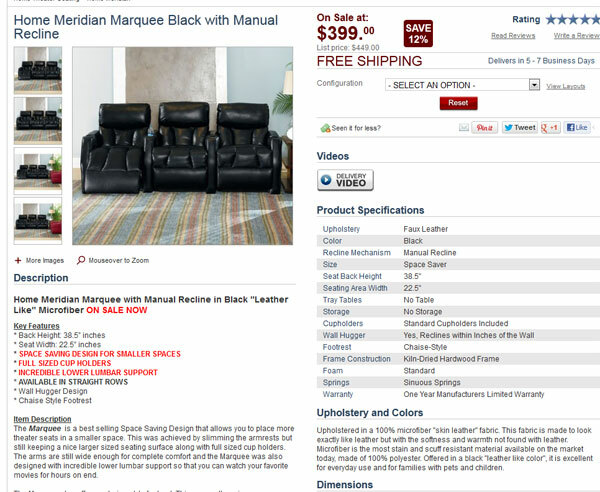 Product pages on TheaterSeatStore combine vital information on one page, such as the Home Meridian Marquee page shown here. 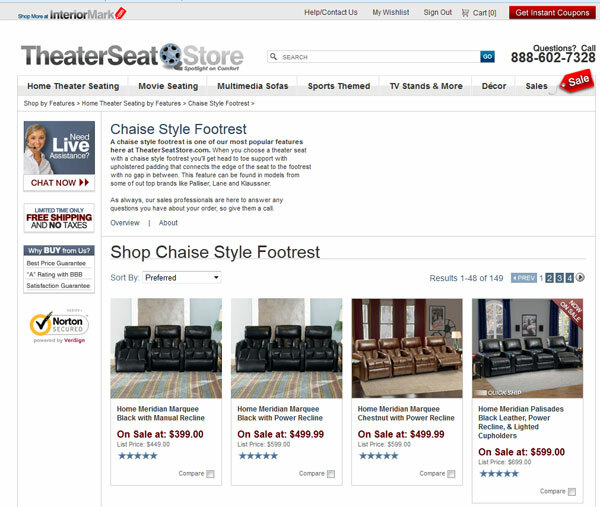 TheaterSeatStore.com Chat Window is Available from Most Pages of the Website.